I would like to introduce you to Family Cloth Wipes! Family Cloth Wipes is an environment-friendly, family owned company. I am a huge supporter of wahm (work at home mom) brands. When I chose to cloth diaper again, I contacted Claudia, the wahm behind Family Cloth Wipes, looking for high quality wipes. Claudia sent my a set of 20 cloth wipes to review. I noticed right away how cute the packaging was, how well made they were and how soft they are! These 6 x 8 inch wipes are double sided (2 ply) with two wipes sewn together to make one for a better clean up. They are 100% super soft cotton flannel with serged edged to help prevent fray so wipes will last longer. They are the perfect size for a travel wipes case! I can fit about 8-10 Family Cloth Wipes in a travel case verses only 4-5 thirsties fab wipes. They make clean ups really easy, that be for diaper changes, face wiping or even boogie wiping! What I love most about Family Cloth Wipes is that they are super absorbent and you only need to use one wipe per diaper change. One wipe gets the job done! Even for those explosions! 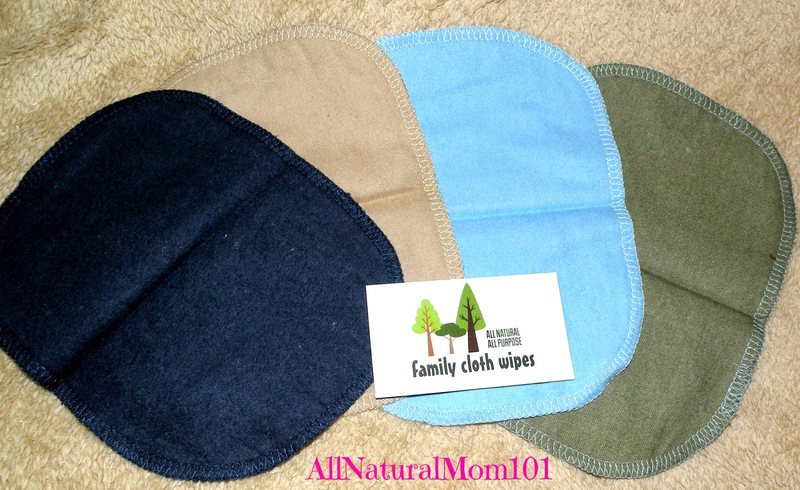 If you are looking into using cloth wipes or looking for something new to try, I highly recommend Family Cloth Wipes! You wont be disappointing! 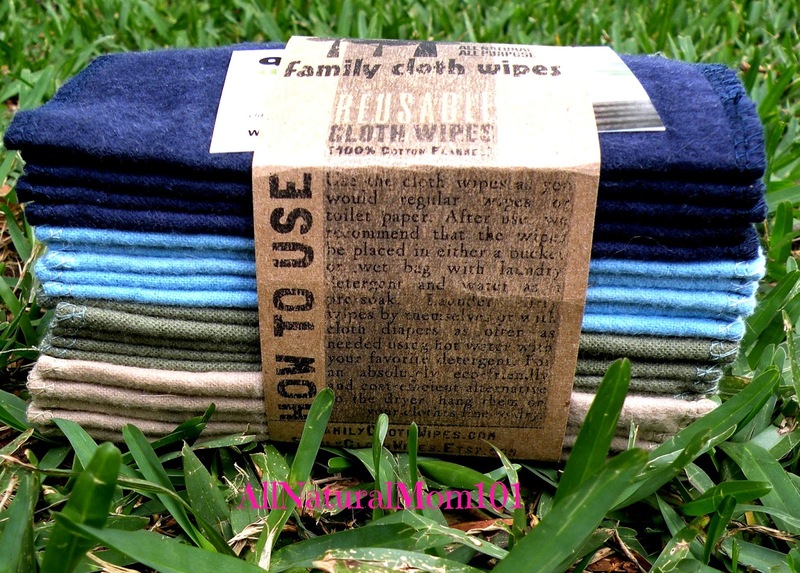 Find Family Cloth Wipes on Etsy! Disclaimer: I was given the products in this post for the purpose of my honest review. I was not paid in any way to write this review. 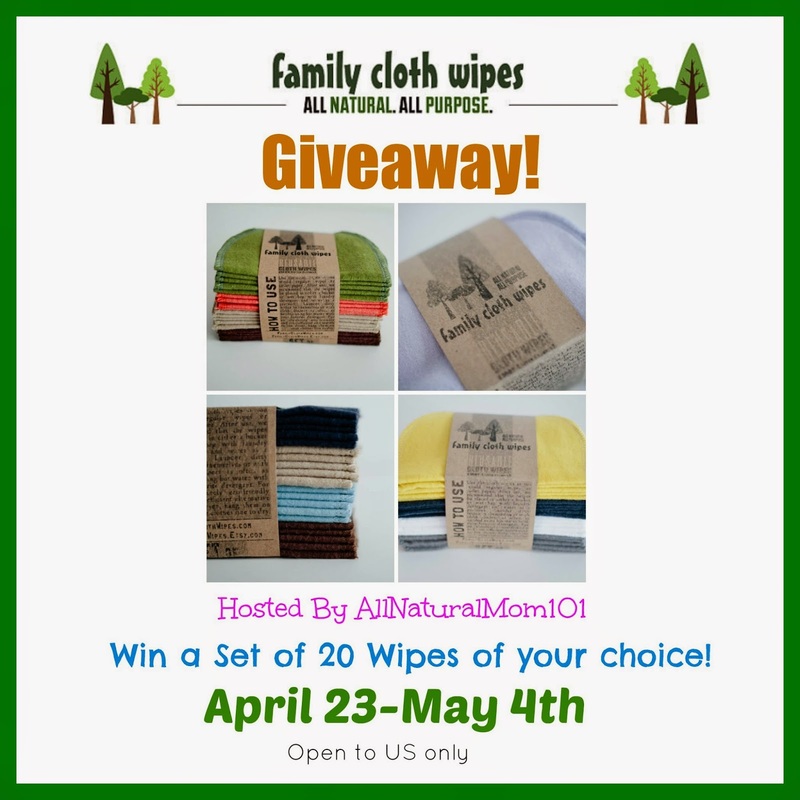 Review & Giveaway Sponsored by Family Cloth Wipes. 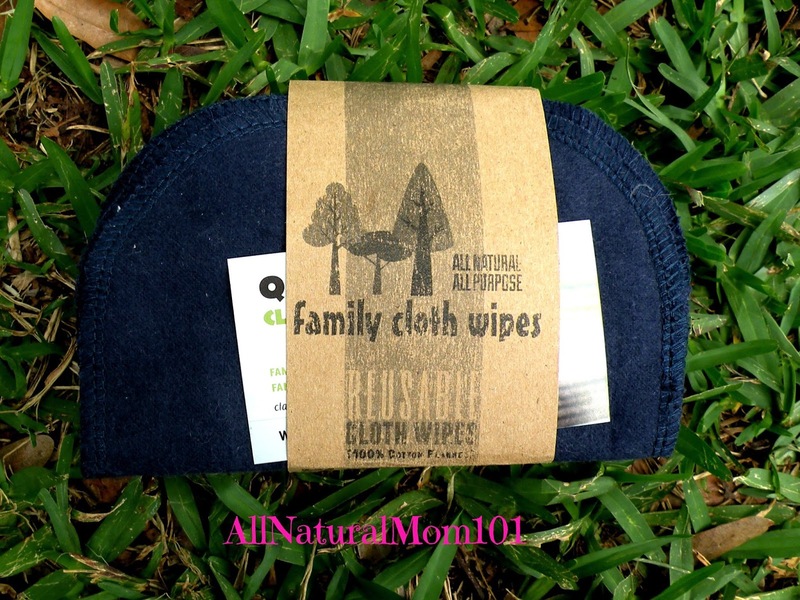 Family Cloth Wipes has chosen to giveaway a set of 20 wipes to one of AllNaturalMom101's readers. Winner chooses color or print. The giveaway starts April 23rd-May 4th. Open to US residents only. I'll wipe the boogies off my baby. I would use these for easy clean up of my little one while we are on the go with my older son's travel soccer. I need these for wiping my little one's nose. He hates paper products and flannel is the only thing he will use. I have these! They're awesome! My whole set gets washed probably every other day. I've had them for about 2 months-- minimal pilling, super smooth still, and super absorbent! The diaper liners are great too! I use them as diaper wipes and all purpose wiping. I would use them as diaper wipes. I would use them as diaper wipes with my cloth diapers. I use cloth wipes for everything, I use them for diaper changes, face clean ups, quick high chair tray clean ups, etc. I love my cloth wipes and need more! Diaper changes and other kid clean ups. We buy way too many wipes, and it feels really wasteful. Diaper changes is what I would use them for. I have some cloth wipes now but could sure use more. Aahhh, I sooo want these! :) I don't use commercial baby wipes and right now just use baby wash cloths. These looks so rad!! I would use them for diaper changes mostly. Most likely for diaper changes! I'd like to use them for my baby's bum! Haven't made the switch to cloth wipes and these look like a great starter!! Diaper wipes with my two littles! I would use them as wipes. I have a toddler and another on the way and would love to be able to not have to worry about purchasing disposable wipes all the time. I am going to be using cloth diapers for the baby and might as well use cloth wipes as well. We already use cloth baby wipes, and I am trying to convince my husband that family cloth is cool. We would add them to our family cloth stash after trying them as diaper wipes. As a gift for a cloth diapering relative just starting out! I use them for cleaning up during diaper changes. All purpose wiping - with three littles, something always needs wiped! diaper wipes for my new little one! You know, I just got some osocozy wipes to compare with these, and I can't believe grow much higher quality these are. Family Cloth Wipes rules!